In a society based on the rigid moral standards of a maniacal leader almost everything is considered deviant. The simple act of thinking for yourself, deciding for yourself between right and wrong, is considered an act of deviancy. There is no room for free thinkers once a society decides to conform to the obdurate views of the unstable leadership it allows to take control. Every sense of freedom becomes hidebound to the dim reality fascism brings onto it's citizenry. Once in place, there are no cracks through which it's victims can escape. For the homosexual population of Nazi occupied Europe this rigid conformity of the masses began the slow walk into darkness. Neighbors, relatives, old coworkers... anyone and everyone could trade their gay acquaintances in for even the smallest token of favor from the new masters of Europe. The jackboots were now marching in the streets and the gestapo was out for the "sexual deviants" of Europe. Over the course of the Third Reich an estimated 100,000+ gay men and women were imprisoned and persecuted for their sexuality. They were put into work camps designed to bring about a slow and painful death. 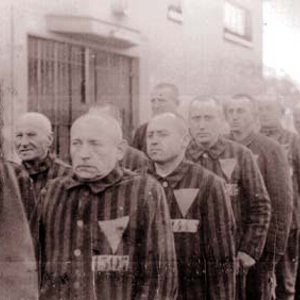 Around 15,000 were sent to death camps were they were adorned with a pink triangle and the number that replaced their identity, their name, and their previous life. Around 60 percent of those who were imprisoned and/or sent away to concentration camps would not survive the Holocaust. For these unfortunate souls their only crime for which they would die would be that of who they loved. But who was the deviant in all reality? Was it the man or woman who was born different from the others? Was it the homosexual who found love in a way different than the prescribed method of society? Or was it the society which turned upon their own and sacrificed those they deemed different to the flames? In the end, for that 60 percent that fell to the sins of conformity, it didn't matter exactly who was the deviant and who wasn't. The price they paid was greater than any that society would pay during or after the war. For the sin of silence, for the sin of complacency, for the sin of hate... those who were sacrificed to the insanity of one man's delusions and the hate of a complacent country could not, nor can not today, be brought back. They paid with their lives for a crime they did not commit. The crimes that were committed during the Holocaust against the homosexual community in Europe didn't occur overnight. Long held political and religious beliefs had paved the way for Hitler's orders to execute the gay citizenry of Europe. A German public had lived with and supported laws that had long oppressed the sexuality of their neighbors. In 1871 The Penal code is established in Germany and it's occupied territories. This harsh set of laws dictated most any moral codes of conduct that society could imagine. However it is paragraph 175 that would establish a legal precedent in Germany for the legal persecution of homosexuals. In no uncertain terms the paragraph made all sexual acts between males illegal and punishable in Germany's courts. The legal framework for governmental persecution of homosexuality was established in the Second Reich. From this point forward the homosexuals of Germany would enjoy only brief moments of "lesser" persecution as the German society pushed it's heel on their backs. Though gay members of society could find some places in Germany to meet and enjoy the facade of liberty in the early 1900s the storm clouds were gathering. The "Great War" saw Germany entering a hellish depression and a renewed religious fervency. Like the Jews and Roma, gays were targeted for persecution with every downturn in German society. With the rise of Nazism the roadwork for Hitler's persecution began to be relayed. During this time the government of Germany dug back to down to the Kaiser's sins and breathed new life into perverse laws. In 1932 Berlin began to crackdown on gays in the city. A new fervor was seen in Berlin as police and city leaders sought out gay bars and meeting places. The old morality laws were back in affect as the year came to a close. As 1933 opens the German people are introduced to their new leader, their fuhrer, Adolf Hitler. The Nazi party is declared the only legal party and is thus in complete control of the country. German society has surrendered it's freedoms, its liberties, and it's minorities to the insanity of a madman and his henchmen. For those trapped inside the country there is no end to the downward spiral their country is now taking. Yet the devil in charge has promised them the world. And for a short period of time, it almost appears that Hitler can give it to them. For the homosexuals the reality of what awaits them in Germany is made clear on May 10th, 1933. A collection of books and documents stolen from the ransacked offices of the Institute for Sexual Science are burned by the SA and Nazi supporters in Berlin. The reason for this book burning isn't that the books are Jewish or Communist. The reason these books are being burnt is because they are deemed unclean due to the "sexually deviant" nature of the institute from which they came. Though the doctor who ran the Institute for Sexual Science was a gay Jew, the homosexual threat was the main reason for their burning. For the homosexuals of Berlin, this book burning was their first warning... Hitler was coming for them. Less than a month later, June 8th, two homosexual rights organizations are outlawed. Their members and leaders are recorded as the Gestapo takes the names off any and all collected documents. Gays in Berlin rapidly respond by simply disappearing into the masses. However the hope of hiding and waiting out the Nazi government are short lived. During the "Night of the Long Knives" Hitler takes the opportunity to not only destroy the SA and replace it with the SS but also orders all homosexuals to be thrown out of the military. Several SA officers and members are charged with being homosexuals when nothing else can be found to charge them with. Though these charges were most likely false, these members of the SA are not imprisoned but rather are shot. Hitler's message to the gay community in Germany is now perfectly clear to all... they are not going to be simply jailed, they are to be killed. As for Ernst Roehm, the SA chief, the charges of homosexuality are not false. From 1930 the position of SA Chief Roehm in the Nazi party had been a signal of false hope to the gay community in Germany. Though the homosexual community could still expect plenty of harassment and even jail terms they had not expected what would happen next. Roehm was charged with plots to overthrow Hitler along with homosexuality. On June 30th Roehm becomes a victim of the party he had fought to help establish. SS members execute Ernst Roehm for sedition and homosexuality. On July 13th Hitler declares himself the sole judge in Germany and that the SS would from that point forward act as his personal police force. With this the message is sent out across the country that a gay member of the SA had been executed. There would be no quarter given to the homosexuals that were now locked inside German borders. By the time October rolled around the SS were actively seeking out homosexuals across Germany. Himmler ordered large roundups of gays regardless of gender under the morality laws, paragraph 175. Those who were caught up in Himmler's dragnet were imprisoned, tortured, and interrogated in hopes of getting more homosexuals' names. For the next two years mass roundups continued without relent. What had started out as a couple hundred arrests rapidly grew into the thousands. Hitler and Himmler were on a quest to rid Germany of the "sexual deviants" and preserve the "sexual purity" of the German race. For those caught in their scheme there was no hope in sight. In 1935 Himmler sent out an order that promised freedom to all homosexual males who would willingly subject themselves to castration as a "cure" for their "degenerate sexual drive". Sadly for the homosexuals who had been in inhumane jail conditions (for some, years) this promise was too good to pass up. Having been brutally operated on by Nazi doctors the victims subjected themselves to experimental surgeries. Those who did not die from the neglectful treatment of the Nazi doctors and castration itself were given a mock release. Once given the hope of freedom, the castrated victims were rearrested and thrown back into the prisons from which they had been released. This sadistic treatment of homosexuals in Germany's new legal system would continue as the homosexuals in SS custody continued to be held without any sign of true release. For years their lives would hang in the balance as the German people ignored the plight of gay men and women across their country. Those who did speak out often faced false charges of homosexuality and were therefore thrown into the same jails where gays died from sustained abuses and neglect to their well-being. On October 10th, 1936 just two years after Himmler took control of the Nazi roundups of gay men and women, the leader of the SS forms the Reich Central Office for Combating Homosexuality and Abortion. This central office will allow the SS and Gestapo to compile complete lists of gays in cities and villages across Germany. From Berlin the Gestapo can monitor the arrests of gays throughout Nazi controlled Europe. They can send out demands for increased pressure on gays in any area at any time as the Nazi leaders envision threats under every rock. During July of 1940 Himmler cleans out the German jails of homosexual prisoners by declaring that all gays in Germany and occupied lands can be sent directly to concentration camps. In true bureaucratic fashion, the SS develop the pink triangle to fit into their numerical death machine. The homosexual community across Europe are now set to join the ranks of the Holocaust victims. Throughout the Holocaust homosexual prisoners were often targeted for extremely brutal punishment by camp leaders and SS camp guards. Abuses were numerous and often left up to the camp leaders themselves. The one thing every camp had in common was the use of force labor designed to bring about death through exhaustion. Gay camp prisoners were made to work some of the most brutal and barbaric camp task. They were made to haul stones, carry boulders, and do meaningless task designed to weaken the victims. To the SS this was meant to break the "homosexual spirit" by applying the "extermination through work program". Failing to do a task, no matter how menial the task might be, often led to sadistic punishments. SS leaders often enjoyed taking gay prisoners to the "singing forests" in large camps. There, on tall poles, the homosexual victim bound with their hands and feet chained behind their body. Suspended in the air from the tall pole the victim's arms would be pulled upward and behind their torso. This would cause serious injuries to the joints and shoulders of the prisoner as they screamed out in torment... thus giving the name to this form of torture. Other gay victims would be subjected to barbaric castrations as a "cure" for their "sexual disease". Nazi doctors and SS soldiers used knives, scissors, and veterinary tools to remove the testicles of their victim. Without medicine for the pain or impending infections, the victim was at risk or bleeding to death and/or succumbing to deadly infections from the sadistic genital mutilation. More serious forms of punishment for homosexual prisoners were often performed in front of the rest of the camp inhabitants. Roll call would often be called when a homosexual prisoner/s would face execution. These brutal acts of violence were used to deter any and all acts of defiance by the gay prisoners. These executions were also used to punish homosexuals after one of their fellow prisoners had run into the electrical wire to commit suicide. In this aspect executions of homosexuals could be seen at times as collective punishment for both their mere existence and their persistent will to live. In addition to work, beatings, torture, harassment by fellow inmates, degradation of all forms, and outright slaughter; many homosexual prisoners also had to face twisted medical experiments. SS doctors were given full reign in their quest to find a cure for the homosexual in German society. These experiments included the usual castrations and genital mutilations. However they also included lobotomies, shock therapy, chemical injections, and hormone injections. Prisoners who were experimented on clearly had no hope of ever being cured. And therefore once they were found to be incurable they were executed. The German people were slow at recognizing the sins they had committed against the Jews... the Roma... the Poles. A generation of Germans would pass away without ever really having to face the crimes they forced upon the world around them. Their hands had forged the worst atrocities that Europe had ever seen. Their hatred had destroyed the lives of millions upon millions. And yet the German people were allowed to remain silent for far too long. For the gay victims of the Holocaust this silence felt like it could not be broken. For all the screams that had been released in those dark hellish camps, for all the suffering that had been brought upon them... the silence threatened to mask their pain. For nearly 60 years the homosexual victims of the Holocaust watched as the world ignored their stories. Many of those who survived decided to go back into hiding. The same method that had failed them during Hitler's reign now showed to be their only hope. The laws that had sent them to the camps were still in place when the Third Reich collapsed. Paragraph 175 clung to the books as the victims of its existence stepped out from behind prison gates. In December of 2000 the German government finally admitted that it had continued to use Paragraph 175 even after 1949. It was the first time that Germany had admitted that homosexuals had been victims of the Third Reich. However it wasn't until May of 2002 that the German government decided to finally pardon all homosexuals who had been convicted, tortured, and/or killed by the Nazis and German government. But what were they pardoned for? Who in this long history of horrific human rights abuses and genocide was the deviant? The man/woman who simply loved differently than the rest or the state and society which bore the ability to hate those they didn't understand or care to love? Want to learn more about this issue or others covered by Alder's Ledge?